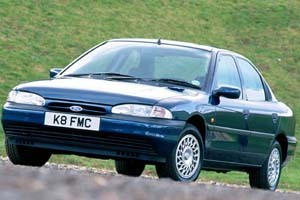 Ford Mondeo (CDW27). 1993–7 (prod. n/a). 4- and 5-door saloon, 5-door estate. F/F, 1598, 1796, 1998 cm³ (I4 DOHC), 1753 cm³ diesel (I4 OHC), 2544 cm³ (V6 DOHC). Ford’s 1990s “world car”, though as usual the US market made so many changes to its Contour and Mercury Mystique versions that one wonders if the US$2,000 million to US$6,000 million project (estimates vary) resulted in many economies of scale. Dull styling clothed class-leading dynamics; earned it the unflattering nickname of Mundano among some in UK. European Car of the Year 1993. American-made V6 for the top models. Not sold worldwide despite ambition: some Asia-Pacific countries stuck with contemporary Mazda Capella-based Ford Telstar.